Developed by Wetstone and released exclusively for the Mega Drive (Genesis), Monster World IV is the sixth and last title in the series. For a long time this game didn’t see an official release in the west, which prompted some interesting fan translations for emulated roms. Luckily the advent of digital distribution on last generation consoles enabled this game to finally get both an official translation and reach a world-wide audience. Graphically the game comes quite late into the life of the Mega Drive and it takes full advantage of everything the development team has learned about creation on the 16-bit console to craft a very pretty looking title. 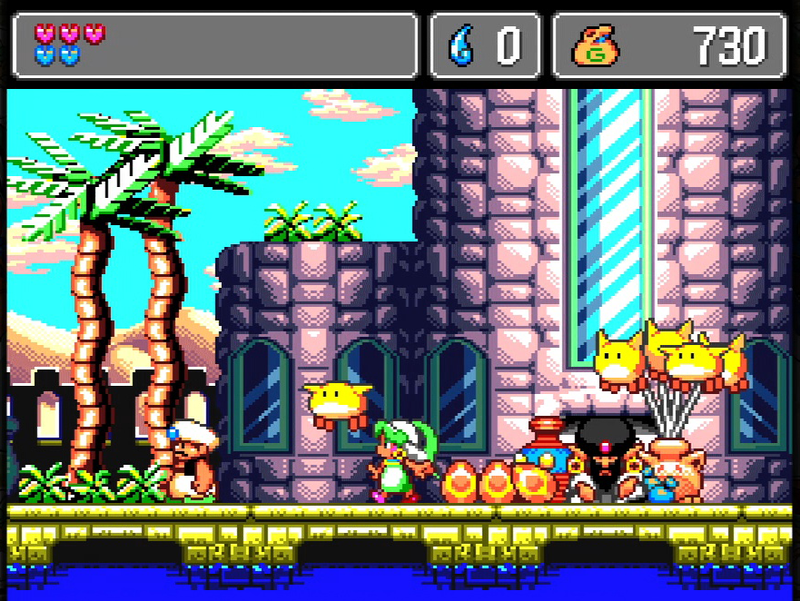 Multiple levels of parallax scrolling are used, environments are luscious and given a 1001 Arabian Nights flavour for the first time in the series, and the already cute character designs the series is known for have been overhauled to be even more appealing. The games 2D sprite-based characters are full of expression, and although Asha is a mute protagonist (as was Shion before her), she expresses frequently through body language. Her design in particular stands out as excellent, always likable and approachable without ever becoming fierce, even when wielding a scimitar in combat. The other half of the games lead duo is a Pokémon-like being called a Pepelogoos that evolves in size and shape throughout. Areas and locations are vividly brought to life with small background animations and great level design, making this one of the most visually well designed games on the console. Characters and locations look great. Sound and music aren’t quite in the same league as the graphical prowess of this title, with some of the background music becoming repetitive over the course of longer dungeons. It’s not a bad soundtrack, and includes nods to the Arabic themes of the title as well as taking the pacing of each area into account when composing for it, but it never gets the most out of the Mega Drive. Sound is workable and for the most part everything feels correct, however occasionally some of the effects can sound tinny when played on newer consoles. The game opens with words whispered to the wind, you as the player see them visually represented on the screen as text displayed on a black background whilst leaves and petals drift past. These are the words of the spirits reaching out for help, and a young girl named Asha can hear them. Setting out from home after gathering her belongings she bids farewell to her nomadic family and leaves on a journey to collect the spirits and restore them, along the way gaining possession of a genie and becoming the adoptive owner of a Pepelogoo that possesses a strange blue skin where all of its kin are yellow. She heads to the great city to speak with the queen, learn about Shion’s adventures and begin her own. As plots go it’s a little more developed than the one seen in the previous title, although the game likes to advance events slowly through occasional comments made by NPCs rather than going all-out into cut-scene territory. A great deal of the storytelling is done in mime between the heroine and her pet, with its evolving into progressively larger and more useful forms a key part of the narrative. Conversations in-game help to forward the narrative. Gameplay takes the platformer more closely to heart in this incarnation of the series and as such it does leave a few of the RPG elements behind but the core gameplay mechanic of increasing the potency of her gear remains. The city serves as a hub area where Asha can spend the gold she’s collected on swords, shields and potions. In this title swords and shields will also have passive bonuses, encouraging you to get the most out of each piece of equipment on a specific stage of the game before tossing it aside for a more powerful attack or defensive stat. Potions can be found in dungeons alongside gold bars and coins, and come in two flavours, healing and restoring Asha to life if she’s killed, but dungeons lock after the boss is defeated meaning that some of these can be missed entirely. This also has the negative effect of cutting down on much of the back-tracking and exploring time other titles got so much mileage out of, although you will thoroughly explore every area in the city. Level design is tighter and requires a little more precision than previous titles, and Asha can swing her sword up, down and across whilst in the air as well as stab downward to bounce off of enemies with it (later digital editions include a trophy for managing this multiple times without touching the ground) and pressing down will pull out her shield and take on a static defensive stance. There’s a scattering of hidden gem stones that when collected will add a permanent extension to Asha’s lifebar that are worth keeping your eye out for at all times and act as rewards for exploration off the obvious path. 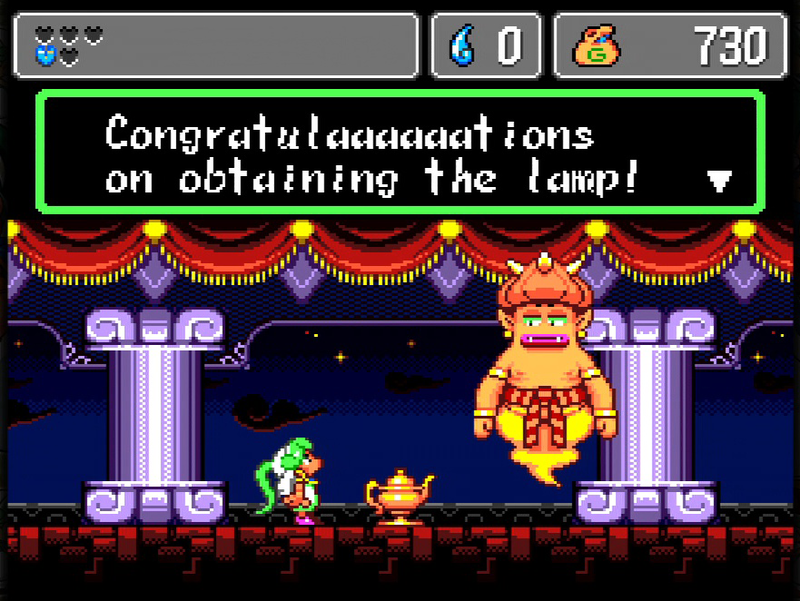 Her partner Pepelogoo can be used to solve many of the games puzzles, including instances where he’s held onto in order to glide a short distance, stuffed into geysers to make a platform and as a shield from lava. The game makes excellent use of Pepelogoo, who can be called to your side in with a button press and whose AI works very well as an automated partner. Overall, Monster World IV is a distillation of all the lessons learned from previous titles in the Monster World and Wonder Boy series and serves as a classic example of the Action RPG genre in many ways. The confined nature of the game, with dungeons locking when they are complete does take a little away, and it would have been interesting to see optional content inside former dungeons become accessible when you returned with new gear, but this is a modern concept being put onto a retro game. What it does it does very well, and its great just to be able to play this game officially. Available on Playstation Network, Wii Virtual Console and on Xbox Live. This entry was posted in 4 Stars, Action RPG, Console and tagged 4 Stars, Action RPG, Console, Genesis, Megadrive, monster world, Sega. Bookmark the permalink.